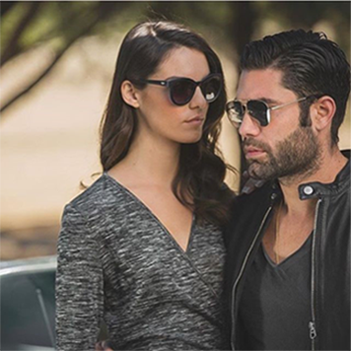 OJO Sunglasses is the next franchise to watch out for. Facts are facts. In just 5 short years, we now have 40 locations in 5 countries. Eight of our fourteen franchisees already own more than one store, and one franchisee even owns ten. This simply means that as franchisors, we take the success of our franchisees very seriously. Furthermore, our designs lead new trends in fashion and are manufactured superbly. They are all sold at very affordable prices including a “Buy One Get One Free offer” with every purchase. We are now ready to partner with more master franchisees in the MENA region who wish to join our successful OJO family. OJO Sunglasses is hard to beat. Due to its unique business philosophy of quality and fashion in high class retail shops, we have become the most successful chain of sunglasses in our country of origin (Cyprus) in just 5 years. With already having exceeded our 2016 goal of 35 locations internationally, we are now on track to reach more locations in Greece, Cyprus, Romania, Lebanon, Malta and other countries in Europe. Our aim today is to take full advantage of the business experience we have gained in order to successfully penetrate and succeed in the whole of Europe and other parts of the world. Most of our franchisees have invested in more than one store because they have identified our brand to be highly profitable, very competitive, while at the same time, totally committed to superior quality, high fashion, professional and friendly service in our “State of the Art” retail stores. With vast managerial experience in sales, marketing, fashion and management, we have become experts in insuring that all OJO Sunglasses stores are built to perfection. We constantly take into consideration the consumers’ needs and purchasing habits, accurately identifying the perfect choice and fit of sunglasses for all our customers wherever in the world they may be. With strong consideration towards our customers, our stores have been especially designed for the ultimate customer experience when shopping at OJO Sunglasses Stores. Using uniquely designed back lit displays and full-length mirrors, our collection of sunglasses is exhibited in a way whereby the beauty, colour and quality of each pair of OJO sunglasses are exhibited with pride. The OJO Sunglasses collection comprises of over 450 styles, sub branded into CLASSIC, TREND, EVERYDAY, LIFE, JUNIOR, MAN, ACTIVE and PLATINUM, insuring that under one brand name, we cater to all tastes of fashion designs and trends. We continually strive for product excellence by offering the latest polarized and optical technology, so as to ensure that our sunglasses are not only fashionable and trendy, but are optically protective from the sun’s rays on the highest possible level, 100% UVA & UVB 400nm. OJO Sunglasses prides itself with adapting to all internationally accepted consumer return policies, insuring the highest level of customer satisfaction and guarantees. Privately owned and under the leadership of its founder and managing director, Nicos Mesolongitis, the OJO Sunglasses management team comes with over 100 years of accumulated retail and business experience. This has resulted in the company’s unparalleled growth and aggressive expansion in 5 countries within a short period of just 5 years. OJO’s relative accumulated revenue across the chain has made it the only dominant sunglasses retail chain of its kind in Cyprus and Greece. Maintaining its strong and reputable brand name in these countries, OJO’s franchisees can enjoy continued chain wide growth similar to the strongest fashion orientated retail chains in the world. • The choice of songs, carefully selected by music professionals, are especially chosen to ensure that our customers enjoy mainstream, up-beat music which encourages buying psychology. • Our selection of music played is so popular that OJO Radio has already been heard by over 300,000 listeners in numerous countries around the world in just the first year of its inception. • The only music allowed to be played in OJO stores around the world must be OJO Radio. • The choice of music also insures that our OJO employees will remain alert and energized during their days work. For more information, please fill out the enquiry form.